A key recommendation of the Halcrow report was that watercourses should be regularly maintained. The watercourse volunteers has worked hard to make sure the town and its watercourses are cared for, that ditches and dykes are fit for purpose and that we have an environment we can be proud of knowing that we have done our best to help reduce the risk of flooding. We’re hugely grateful for all the many hours of hard work that’ve been put in so far and to the lovely volunteers who’re bringing us refreshments too. At meetings in June the volunteers showed continued interest in monitoring watercourses for riparian owners and some will oversee six different stretches as identified below. Upton Road to Newark Road bridge is managed by Trent Valley Internal Drainage Board. Newark Road bridge to Potwell Close footbridge and Shady Lane bridge to Church Street bridge is private property of Riparian Owners. From the bends upstream of Church Street bridge, to the bridge in the corner of the War Memorial park nearest The Minster School is managed by the Town Council. Nottingham Road area of Potwell Dyke plus Springfield and Brackenhurst Dumbles is mostly managed by Notts County Council. Potwell Dyke from Lees Field to footbridge beside Holy Trinity Church and upstream to the Halloughton Road culvert and then to the confluence with the Intake Dumble is managed by Riparian Owners. From Potwell Dyke confluence with The Intake Dumble and through Westhorpe to Top Town Pond, is also the private property of Riparian Owners and County Council. 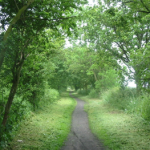 The Cess Ditch from Station Road to Archers Field and the Maltkiln Ditch further along beside the Trail towards Maythorne, is managed by The Countryside Officer, Country Parks and Green Estate Services, Notts County Council and Friends of Southwell Trail. If you wish to be involved in any future debris clearing sessions, environmental bio-diversity projects such as removing invasive species and helping on various projects with NTU students or other agency partnerships, keep checking the Calendar page on the SFF website. The Potwell Dyke clearing project has been entered into East Midlands in Bloom, as one of Southwell’s community environmental projects, to be judged in July 2014. There is a river monitor in the Potwell Dyke on Halloughton Road which was kindly donated by Tim Keay of Precision Sensors Limited. This gives constant information on the height and flow of the Dyke and can send alerts to pre-determined phones and emails when certain triggers are met which may indicate a potential overflow situation. Tim has won the ‘preferred supplier’ status with the Environment Agency, and further monitors will be installed in chosen locations in Southwell in due course.